Chess Bazaar has some of the best chess artisans in India who ensure you enjoy customized chess sets that are handmade. The company was founded in 2007 and ever since, it has grown in terms of quality and diversity. They ship their products globally so wherever you are, you can order online and have your chess set delivered to your door. The following chess Bazaar review will explore the 7 top sets. This stunning chess set comes with a 4-inch king and carefully crafted pawns. The pieces are large enough to ensure you have a fun time playing. The dark pieces are made out of sheesham wood while the lighter pieces are made out of boxwood. This chess set adds a new twist to your gaming, allowing you to use it in a commercial or residential setting. The precise craftsmanship ensures that they are both functional and aesthetically appealing. You won’t have a hard time distinguishing chess species from the opponent as they are distinct. These are waterproof chess pieces that ensure you enjoy playing chess for a long time. Their durability and beauty ensure they fulfil both aesthetic appeal and functionality. They are made from fade resistant wood that does not easily break or crack. The lighter pieces are carved out of boxwood while the darker ones are made from ebony wood. The chess pieces come with a matching chess board that ensures you don’t get confused when playing. The affordable pricing and durability of this product ensure you get value for your money. Since the pieces are a made from wood, purchasing this product ensures you contribute to environmental conservation. The durable material can withstand falls as this cannot be entirely avoided. This is an ebony and boxwood chess set combo that guarantees a long lifespan. It comes with a chessboard, ensuring you don’t have to worry about extra purchases. The 4.5-inch king ensures you have an easy time distinguishing it from other pieces. Each piece has a based lined with green felt so that they move smoothly across the chessboard. You can shop online with confidence since the package is true to description and the pieces true to size. This customized chess set is suited for commercial as well as residential settings. The lighter pieces are carved out of boxwood while the darker pieces are made from ebony wood. The clear distinction in the separate sets gives you an easy time identifying your pieces from your opponent’s during a game. The long life and durability of this chess set are its main selling point. This is a bigger than tournament chess set that is beautifully crafted to ensure you have a customized experience. The smooth surface of the chessboard ensures you have a fun time playing. The pieces are heavy to ensure they don’t easily topple over as you play. This is a high-quality chess set whose beauty has been enhanced by the lacquer finish. The chess sets have been painted crimson and ivory white so that you have an easy time distinguishing opponent pieces. The white against crimson makes for an excellent combination that goes well with the matching chessboard. This chess set is ideal for commercial as well as residential spaces. You can use it to play chess at home or in the office with colleagues. This set is popular because of its creativity and traditional feel. The amazing detailing and design ensure you get value for your money. This is an elegant chess set that is both decorative and functional. It is a traditional Staunton set that is made out of high-quality material. This mid-sized set is affordable, and you get a 100% refund in case you choose to return it. This chess set comes with a 4.2-inch king that is easily distinguishable from pawns and knights. This contemporary chess set has pieces that weigh 63.490z. The combination of boxwood and Bud rose ensures you have an easy time identifying your pieces on the board during a game. The white side is made from boxwood while the opposite side is carved from bud rose. You get two extra queen that makes pawn promotion easy. Each piece weighs enough to ensure you get that satisfying thud when you play. These are hand-made pieces that ensure you get a personalized playing experience. The felt base ensures stability so that pieces don’t topple over during a game. The green velvet used to line the inside of the chessboard ensures that pieces move smoothly across it during a game. The superlative knights, as well as the free queen, makes the game fun. This astounding craftsmanship of this set ensures you get value for your money. This is a chess set that comes with a 3.7-inch king with a 1.6-inch base diameter. The set comes with extra queens, making pawn easy. These are double weighed pieces that do not easily topple over when you play. The felt-lined chess piece bases ensure you have an easy time moving them across the chessboard. The lighter pieces are carved from boxwood while the darker ones are made from green ash burl. These are pieces made with hi-gloss finish that ensures they are aesthetically appealing. These reproduced Russian Soviet-era pieces are suitable gift ideas for history buffs. The chessboard is made to match the chess pieces so that you have a fun time playing. Chess is a popular game, and this chess set enables you to play at home or at the office with colleagues. This is a chess set made in Spain with professional chess set craftsmen. Purchasing this chess set allows you to relive the Soviet-era when many Russians won chess world championships. Between 1993 and 2000, chess was a big part of Russian culture and history as most world champions were Russians. This chess set comes with a chess board. The 34 piece chess set comes with two extra queens, making pawn promotion easy. This is a handmade chess set that guarantees a personalized experience. 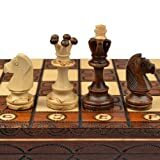 The lighter pieces are made from boxwood while the darker ones are carved out of ebony wood, allowing you to clearly distinguish your pieces from your opponent’s. The aesthetic detail on these pieces ensures you get value for your money. The spectacular detailing of this chess set ensures that you purchase a customized product. The smooth base of the pieces as well as the felt lined inside of the board ensures that the pieces are moved smoothly. This is a chess set that has been meticulously carved to ensure you get value for your money. It is a hand-made set that guarantees durability and a long lifespan. The 3.8-inch king is easily distinguishable from the pawns and knights. The exceptional craftsmanship, as well as the uniformity of the pieces, ensure you have a fun time playing. ChessBazaar brand is one whose main focus is to deliver high-quality products. This is a customer-centred company based in Mohali, Punjabi in India. It focuses on ensuring you enjoy playing chess with high-quality chess sets. Whether you are a history buff or one who appreciates luxury, Chess Bazaar has something for you. These homemade chess sets have unmatched uniformity, ensuring that pieces don’t have disparities. There is a wide range of chess sets to choose from, and the web site’s user interface is easy to navigate. Chessbazaar ensures that you get quality at an affordable price. This is a big brand with unmatched customer satisfaction due to their consistency in delivering quality products. Chess Set is a company that was founded in 2007, and it focuses on producing handmade chess sets. The company mainly uses wood to make it’s chess sets and chess boards. Ches Bazaar is known to provide chess sets that come with chessboards; you don’t have to worry about extra expenses. The high-quality chess sets hardly crack or break, and you can easily request for piece replacements in case you lose some. The excellent customer support is guaranteed to cater to your needs and the emails are instantly replied. Chess Bazaar has a 100% refund policy that allows you to return chess sets you are not sure about. All you have to do is communicate with the customer support team for directions. Ensure that the product you are returning is unused and that the packaging is original. The instructions are easy to follow, and you get your money back after ten days. The process is fast and seamless to ensure you have a personalized experience. Chess Bazaar mainly deals with supplying chess sets across the globe. This Punjabi based company ensure you enjoy chess with high-quality chess sets. There are also chess set accessories that ensure you protect your chess set from loss or damage. The wide variety of collections available ensures that there is something for everyone. Chess Bazaar uses the finest quality to make chess sets so that they last you a long time. The packaging is also sturdy to ensure your product arrives in pristine condition. Chess Bazaar’s high-quality chess sets are surprisingly affordable. The customer-centered company ensures you get value for your money. The 100% refund policy ensures you don’t get stuck with a chess set you are not comfortable with. The wood carved sets are durable, and with every penny, you spend on them. Chess Bazaar’s main competitors are Chess House as well as MegaChess. These chess companies all focus on delivering quality and as big players in the chess industry. Each brand has its own unique products, and you can easily visit their websites online to figure out which company has products that interest you. Most of Chess Bazaar’s chess sets take the spotlight due to their uniqueness and quality. Chess Bazaar has an unmatched keenness when it comes to detail that ensures you enjoy customized chess sets. The company is known for their global shipping services as well as the unmatched Indian artisan who make the chess sets. 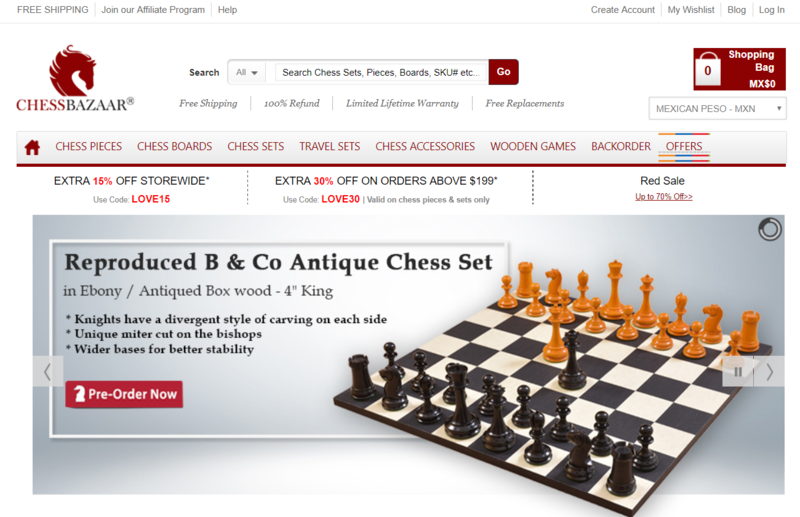 Chess Bazaar is a well-reputed brand that ensures you get value for your money. This chess bazaar review discussed the high-quality chess sets guarantee a long lifespan. The website is easy to navigate, ensure you have an easy time finding what you want.